Significant tension can exist between the goals of architectural research and those of architectural and building practice. Worthwhile research involves generating risks as the benefits from its outcomes are uncertain and they require interpretation in practice as new design approaches or construction methods. In contrast, architectural and construction practice generally involve managing building procurement risk. This can encourage the practitioner and construction team to resist changes to their methods to enhance solution reliability, even if the method delivers less than optimal performance. Practitioners can be innovative but often only by incremental development: each step within the bounds of risk acceptable to others in the design and construction team. 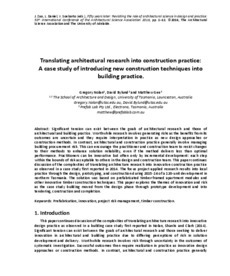 This paper continues discussion of the complexities of translating architecture research into innovative construction practice as observed in a case study first reported in 2014. The focus project applied research results into local practice through the design, prototyping, and construction during 2015-16 of a 120-unit development in northern Tasmania. The solution was based on prefabricated timber-framed apartment modules and other innovative timber construction techniques. This paper explores the themes of innovation and risk as the case study building moved from the design phase through prototype development and into tendering, construction and completion.